*If you think you know how this movie will shake out, think again. The trailers for “Bridesmaids” in no way capture how deliciously funny, pathetic and how relatable the characters are in this film. If you have ever had any experience as a bridesmaid or maid of honor you immediately start to identify with one of the characters in the movie. The storyline is very simple, but exaggerated and exposed in a way that sends viewers into nonstop side busting laughter. And, it’s not just another movie about wedded bliss and all the happiness that goes into the big day. It is actually quite the opposite, and, exactly how the writers intended it to be. The movie’s lead character Annie played by its co-writer, Kristen Wiig (“Saturday Night Live (SNL” and “Knocked Up”), was asked by Judd Apatow producer of Knocked Up and The 40-Year- Old Virgin to write a script. Wiig phoned good friend Annie Mumolo and the creative process began. The storyline was the brainchild of Mumolo, the two agreed to write the script together and began putting pen to paper as they had done years earlier at The Groundlings, a Los Angeles based improve troupe, where they developed their creative relationship. The ladies in this wedding party are not the “typical” cutesy twenty-somethings excited about a young girlfriend’s wedding. The women of this wedding party are very different people at very different points in their life, which makes for a very interesting cast of characters, a comedic dream. The cast blended flawlessly. First, there is Annie, the lead character and maid of honor, played by Wiig; her best friend, Lillian (played by Maya Rudolph), the biracial bride, who tries to be supportive of her best friend while trying to enjoy the moments leading up to the big day; the antagonist Helen, played by Rose Byrne, fast tracking her way into the bride’s new BFF category, and who is identified in the movie as the “B”; then on to Megan, sister of the groom, played by Melissa McCarthy, who is insane; now enter Rita, played by Wendi Mclendon-Covey cousin of the bride, wife and mother who is over the whole marriage and kids thing, wants to have fun while trying to corrupt newly married Becca, played by Ellie Kemper, who is fresh off of her honeymoon to Disney. Annie’s life is moving counterclockwise. She is a distraught, stressed out and depressed former business owner who lost her business, her longtime boyfriend, is forced to share an apartment with an obnoxious brother and sister duo to avoid moving in with mom (played by the late Jill Clayburgh), she drives a hooptie, takes on a lover who is emotionally unavailable and condescending, missing cues of affection from a potential new love interest, Officer Rhodes, (played by Chris O’Dowd) all while losing her best friend and bride-to-be Lillian to a life of marriage and Helen – – the beautiful stay at home county club trophy wife of the groom’s boss. Helen is nice nasty in a clueless kind of way. This movie is back breaking, side cracking comedy that you just don’t want to miss. See the movie and tell Lee Bailey what you thought about it! 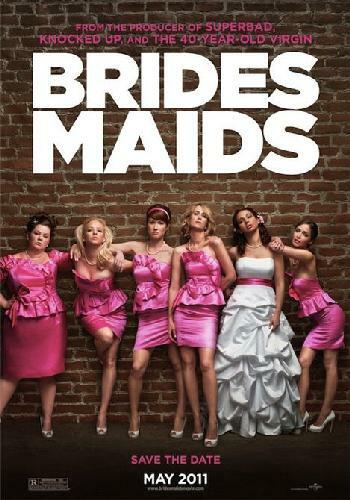 For more on “Bridesmaids,” check out www.bridesmaidsmovie.com.